- You’ll get this quest randomly from either Preston or Radio Freedom once you get into the meat of the Minutemen quests. There’s no saying when it will pop up, so keep saving settlers and settlements alike until you get the chance. Given where it’s located, this seems more likely to be one of the last Minutemen rescue quests you get. - Somerville Place is located in the far southeast of the Commonwealth. Unless you’ve been exploring a lot - or you’re late into the game, I guess - you’re not likely to have wandered through these areas too much. Expect lots of encounters with Mongrels, Super Mutants, and Raiders along the way. As with most areas, you’ll avoid trouble with greater frequency if you avoid roads and major routes and stick to the woods, which are abundant down here. Is particularly easy to get there if you stick to the water’s edge and swim when necessary, assuming you can soak up the Rads. - The Settlers of Somerville Place are having issues with Raiders. Best you waste the bastards, yes? You’ll find them in Hyde Park, found to the northeast of Somerset Place. It’s back within the city limits, and depending on your progression you may find it easier to hop to Diamond City and head southeast. Your choice, though. - Hyde Park is a tricky bit of terrain to explore, as much of it has been flooded, making any sort of approach difficult. The Raiders are almost all up on the buildings of the area, as well, and they’ll run between buildings via catwalks to take potshots at you. Your first priority needs to be getting out of the water and onto these catwalks, or, at the very least, into the buildings. You can find a largely-unguarded hole for that very purpose if you check along the northeastern walls. - The rest of Hyde Park consists of picking your way through the buildings and killing Raiders one room at a time. They’re usually up on the walls, watching the perimeter, but occasionally they’ll patrol through the lower rooms; you can carve up their numbers more quietly by remaining in these rooms. You can also draw them into these rooms with lots of moves to bottleneck them, which is generally safer than exposing yourself on the rooftops. - All done. Return to Somerville Place for your reward, then go to Preston to receive your experience. 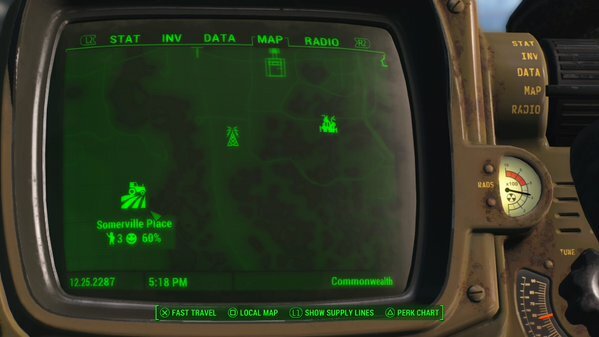 This will unlock Somerset Place as a settlement you can use. Somerville place is in the south west. what would be helpful is, if you mentioned that doing the Brotherhood of Steel quest to get food from farms, locks you out from being able to acquire Somerville place. this puts the farm under the protection of the BoS. so you will not receive the quest from the minutemen. i didn't realise this would happen when i did the quest at the time. it's only now that it's the only settlement left that i haven't unlocked that i realised what had happened. trying to find a workaround at the moment(hence why arrived here). so far, no one has even mentioned it. This is glitched for me. Coincidentally, I had already been to Hyde Park and killed everyone recently whilst on my way to pick up a dead drop for the railroad, which then lead me to vault 95. Since Sommerville Place was right next door, I decided to finally go do the Raiders Trouble quest. I'm just assuming this is the reason its glitched btw. The target location doesn't show up on the map and if I go back and kill them, the quest still doesn't update. I've even tried talking to the quest giver to see if I could tell him. I don't know what to do.